The Solana Retirement Community is a senior living complex located near Deer Park Town Center. The upscale community includes spacious apartments and many amenities, such as an indoor saltwater pool and rooftop garden, complete with a bocce ball court and putting green. The rooftop garden provides the opportunity to be socially active, involved and connected. 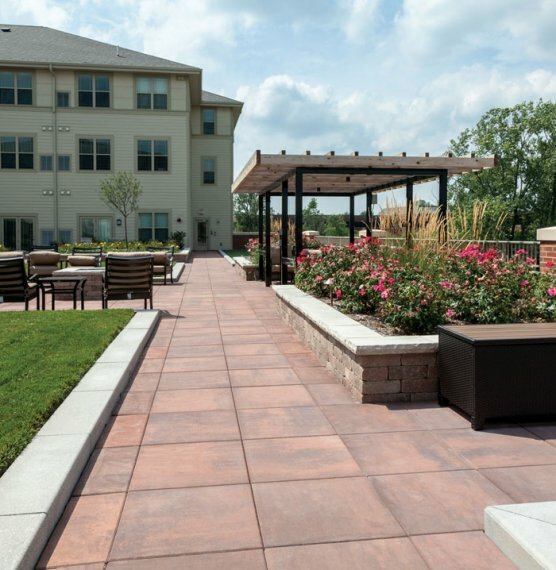 The surface of the roof deck uses Skyline™ 24×24 slabs for a smooth and linear pattern and creates harmony between the building, the outdoor space and the landscape. The patio space incorporates lounge areas, green zones with planters and gardens created by decorative walls made with Ledgestone™ coping and Brussels Dimensional System™. The paving design of the surface and the decorative walls create relaxing atmosphere and feeling of unity with the nature.